​Dealing with customers is an important part of doing business online. ​Whether it’s done by email or by phone, dealing with customers in a courteous and professional manner is essential for Internet business success. In fact, the only way to keep your customers happy and retain customer loyalty is to do your best to deal with your customers in a kind and friendly manner and keep them satisfied at all times to the best of your ability. ​Dealing with customers by email is one thing, and that in itself it simple to do. Simply answer their questions, get to the point, and respond right away. But when it comes to dealing with customers over the phone then things begin to change. You: Thank you for calling ABC Solutions, this is George speaking how may I help you? Then it’s important to remain quiet and listen carefully without interrupting the customer until they’re done speaking. 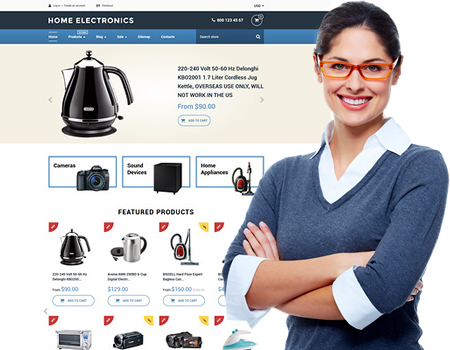 If the customer is inquiring about a particular product then be sure to have that product page open on your website. You can use the product page as a reference in order to answer any of the customers’ questions. If they want to know more about the product then you can begin to point out all of the product features so that the customer can become aware of the fact that you are familiar with the product and the product line as well. And if you built your business based upon a niche market then you should already have a basic knowledge and understanding of the products on your website. You should also have one or two of your distributors’ websites open as well in order to be able to check for stock and availability at all times. However, when you’re dealing with multiple distributors then you shouldn’t have any problems finding the products you need, when you need them. After the customer has asked all of their questions and you have responded with complete and adequate answers then you can proceed to ask for the sale. You: Would you like to place your order today? If the customer says no then listen closely while they explain their reason(s) not to buy and then address those issues in a calm and knowledgeable manner. And if it’s ok to do so then ask for the sale again. If the customer says yes, then you can proceed to ask the customer for their “ship-to’ address followed by their billing information as well. You can take the order on paper and then later enter the buyers’ information into your websites’ shopping cart or you can place the order on your website shopping cart right there and then while the customer is on the phone. Then give the customer the complete total cost of the sale with shipping including and repeat their ship-to address as well. Give them the order number and ask them if there’s anything else that you can help them with. If not, then thank them for their order and wish them a great day! The customers experience with you should be brief and pleasant and they should feel assured that all their needs have been met. And most importantly, be sure to be honest with the customer at all times, without exception as honesty is the most important aspect of doing business online and offline as well. ​Although highly unlikely, there may come a time when you might have to deal with an angry or uncooperative customer. And there are a few reasons why a customer can become upset as well. Whatever the reason may be, it is important to deal with the customer in a calm and professional manner in order to get the matter resolved as quickly as possible. And there are a few skills that can help you to accomplish this as well. Self control: It’s easy to be kind and courteous when a customer is kind and courteous to you and is also making a purchase from your business. Yet it takes a great deal of self control to deal with an angry and non-cooperative customer and defuse the situation in a calm and peaceful manner. ​And some of the most important skills to learn and remember when dealing with customers are just that - to be kind and courteous at all times. ​​​And an easy way to practice this is to always remember that no matter what the customer says or how angry they get, they can not harm you in any way shape or form; other than with their words of course. But this is business, so always remember not to take anything personal. Furthermore, if the customer has purchased a product from you then it’s in your best interest to remain calm at all times and to calm the customer down in order to keep the sale and avoid a refund. Most problems and misunderstandings can be fixed right over the phone. However, sometimes a customer can simply be unreasonable and feel that they have to yell in order to get their point across. But if you can manage to respond in a kind and gentle manner then you can calm the customer down and fix the problem at hand or at least do your best to make it right. Another important skill to learn and remember as well is to be quiet and to listen to the customer at all times. Let the customer speak until they’re done speaking without any interruptions on your part and then answer their question(s) as quickly and as precisely as possible. If there was a problem with the order and the problem was an error on your part then apologize and do everything you can to fix the problem, even if you have to take a loss in the matter. For example, if you have to pay to have the customer ship the product back to you or to the distributors’ location then do it. And then replace or re-order the new product right away. ​If the problem occurred due to an error on behalf of the dropship distributors’ then you will still have to take the blame on behalf of the distributor, even though it wasn’t your fault. Sure, you can tell the customer that someone messed up in distribution but you will still have to apologize, take the blame (or partial blame) and rectify the problem. And if the problem occurred due to the customers fault then kindly show them their error and then do everything you can to correct the problem and make it right - even if it was the customers fault. However, some times it’s best to try to take the blame or at least partial blame on yourself in order to defuse the situation. Place the customer on hold while you quickly figure out a solution. Then present your solution to the customer to make sure they’re in agreement with what you have to offer and then proceed accordingly. Apologize one last time, wish them a wonderful day and then execute the solution right away. One of the best aspects of this or any type of internet business is that you don’t have to deal with the customer in person or face to face. You’ll be dealing with them via email, live chat and/or by phone, (if you decide to add a phone number to your website). However, the likelihood of any real problems arising in your day to day business operations is highly unlikely. As long as you make sure that you ship the right product to the right customer and on time as well then there’s no reason why you should have any problems arise in your business. And as long as you conduct your business in an honest, ethical and professional manner then everything should go well as planned. The customer is happy, your business has made a profit, and it’s a win-win situation for all.